The third week of Star Wars ABC's forges onward as we anticipate the release of the movie trilogies on Blu-ray! "Sir, the ship no longer appears on our scopes." "Captain, Lord Vader demands an update on the pursuit." "Get a shuttle ready. I shall assume full responsibility for losing them, and apologize to Lord Vader." 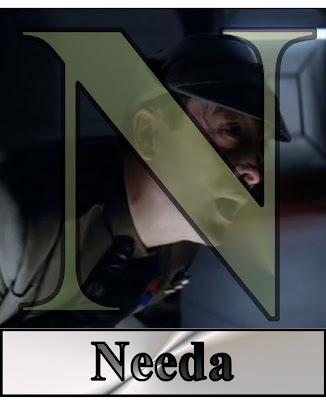 The universe never turned on someone more quickly than Captain Needa. One moment, he had Darth Vader's prize--the Millennium Falcon--in his clutches; the next, the Falcon was gone. Of course, Lord Vader wanted to know what was going on (a crewmember likely tweeted that Needa's Star Destroyer, the Avenger, was in hot pursuit of the galaxy's most wanted space pirate)...and Needa, being a noble officer, fell on his sword. Or, more accurately, the deck of Vader's Executor. TOMORROW: He's the man who refuses to let Luke go to the Tosche Station to pick up some power converters.